Coordinating rehearsals, playing concerts, and fundraising can be incredibly time consuming. For someone who’s running their own nonprofit small arts organization, social media can fall through the cracks. Often, social media becomes something you do on-the-fly when you have free time (likely late at night once everyone else is asleep) or when you are promoting a fundraising campaign or a concert. Unfortunately, if you don’t spice up the content you’re sharing on social media, your audience could lose interest in and become less engaged with your organization. Enter Buffer, the answer to your prayers. I have used Buffer in both a professional and personal setting for a while now, and I still swear by its easy-to-use interface, flexibility, and customer service. Call me biased (the customer service folks sent me a free t-shirt! ), but Buffer is probably one of the best tools you can invest in to ensure that your social media posts are consistent and varied in content. Simply put, Buffer schedules posts for social media. You hook up your social accounts, and then you schedule posts for all or some of your accounts with a single click. Buffer also allows you to share a post immediately, schedule a post for a later time, or drop a post into a queue for that adheres to a customizable schedule. Buffer’s integration with bit.ly is also noteworthy. Buffer can connect your bit.ly account and automatically create shortlinks for every URL you share. In addition, Buffer offers some analytic data of its own, including post reach and clicks. While these stats do not go as in depth as Facebook insights or Twitter analytics, they certainly help gain a birds-eye view of engagement from a single location. Buffer’s analytics are ideal for someone who is too busy to dig through each individual social networks’ built-in analytics. Individual Plan: You can connect one social account for each social network and are limited to scheduling 10 posts at any given time. Price: Free! Awesome Plan: You can connect up to 10 social accounts for each social network, are limited to scheduling 100 posts at any given time, have a more customizable post schedule, and can connect up to 15 RSS feeds. Price: $10 per month, or $102 per year. Buffer for Business: Varied features depending on business size, including 25-100 connected social accounts, 5-20 team members, unlimited number of posts, richer analytics, and everything else offered to the Awesome and Individual plans. Price: $50-$250 per month. While the Individual Plan is a great start, the 10 post limit can be a turn off for some organizations. At the same time, the $10 per month cost of the Awesome Plan with a 100 post limit may seem too costly for a small arts organization. But don’t be discouraged just yet. Last week Buffer introduced Buffer for Nonprofits, which offers nonprofits a discounted rate of 50% off any Buffer plan. That means that if your small arts organization is also a nonprofit, the Awesome Plan only costs $5 a month. It’s incredible what that $5 a month gets you: a tool that helps you deliver a consistent and scheduled message with varied content across all of your social networks. Investing in Buffer was already an easy solution for running your social media. 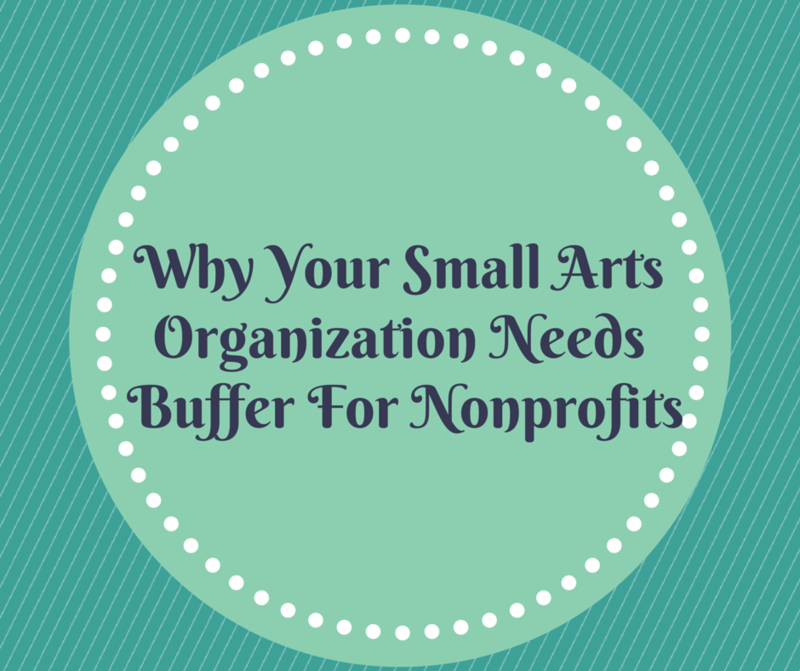 Now with nonprofit pricing, Buffer makes managing a small arts organization a little more manageable. How’s that for cost-effective?